The Daniels Fund Ethics Initiative at UCCS held the first Southern Colorado Higher Education Consortium Summit April 4-5, 2019 at Western Colorado University. Each of the 10 participating SCHEC schools were in attendance to focus on the topic, “Ethics in the Outdoor Industry.” Students, faculty and business leaders heard from industry leaders on the importance of ethical conduct in outdoor and recreational industries. One hundred participants listened to a series of keynote presentations and panelists from a wide variety of professions. Additionally, all attendees had the opportunity to engage in small group discussions designed to promote and facilitate conversation around ethical behavior. Business leaders were a primary focus of the event, encouraging conversation and supplementing discussions with examples from their real-world professional environments. The Ethics Summit kicked off April 4 with a reception and keynote address from Jason Bertolacci. Bertolacci served as the Colorado and Wyoming Region Director for the International Mountain Bicycling Association and co-founded the Outdoor Alliance Colorado. He now sits on the Colorado Outdoor Recreation Partnership, is an advisor to Colorado’s Office of Outdoor Recreation Industry and was part of the successful 2018 campaign to pass constitutional reforms banning political gerrymandering in Colorado. Over dinner, Jason encouraged students to consider the economic impact and career opportunities of the outdoor recreation industry, as well as the cost associated with overuse of Colorado’s public land. The following day, participants listened to keynotes from business leaders John Norton, executive director of the Gunnison/Crested Butte Tourism Association, and Keith Baker, member of the Chaffee County Board of County Commissioners. 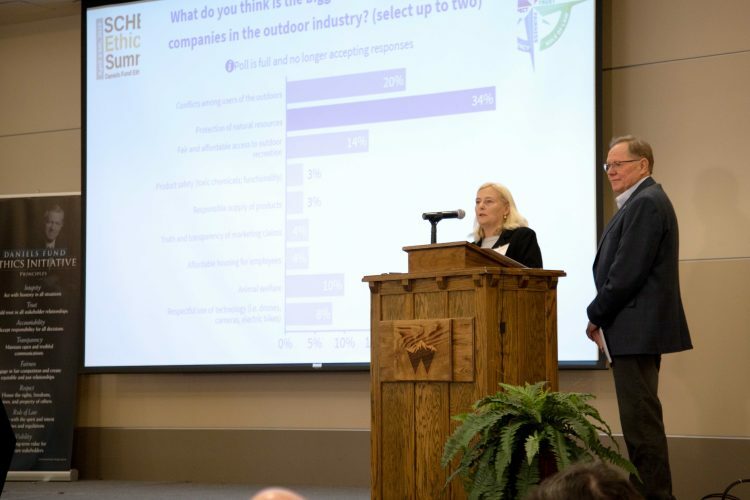 Both keynotes emphasized treating people with respect, compassion, and to be open to new ideas and perspectives of businesses in the outdoor industry. Two business panels were organized in the morning and afternoon, which included Roanne Houk, founder, owner, and CEO of Acli-Mate Natural Sports Drinks; Jesse Kruthaput, Upper Gunnison Project Specialist of Trout Unlimited; Frank Kugel, general manager of Upper Gunnison River Water Conversancy District; Becky Leinweber, executive director of Pikes Peak Recreational Alliance; Tyler Long, founder of Tyligent Industries Inc.; Kirstie Pike, owner and CEO of Prois Hunting Apparel for Women; and David Wallace, assistant professor of business administration, Illinois Wesleyan University. The Daniels Fund Ethics Initiative at UCCS aims to instill ethical principles into the personal and organizational decision-making process of every member of the UCCS community. The initiative is funded by a grant from the Daniels Fund, Denver. 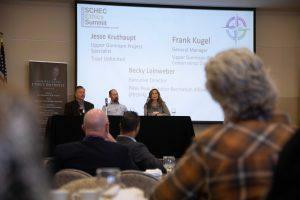 Since 2016, the Daniels Fund Ethics Initiative at UCCS has partnered with schools of the Southern Colorado Higher Education Consortium to expand principle-based ethics education. College presidents select one faculty member to be an Ethics Champion for their campus through an Ethics Champion Program. The Ethics Champion engages with the DFEI at UCCS to spread learning opportunities to campuses. For more information, visit www.uccs.edu/businessethics/. The University of Colorado Colorado Springs, located on Austin Bluffs Parkway in Colorado Springs, is one of the fastest growing universities in Colorado. The university offers 48 bachelor’s degrees, 24 master’s and seven doctoral degrees. UCCS enrolls about 12,500 students annually. For more information, visit www.uccs.edu. Founded in 1911 in Gunnison, Colorado, Western Colorado University has grown to be an important center of higher education in the heart of the Rocky Mountains. Designated by Forbes as one of the Top 100 Colleges in the West for the last five years in a row and recently named a College of Distinction for 2018-10, Western’s location, academic excellence, and devoted faculty combine to offer students an individually engaged education and an exceptional lifestyle. Western has 28,000 alumni, including highly successful graduates in many fields and disciplines living throughout the world. 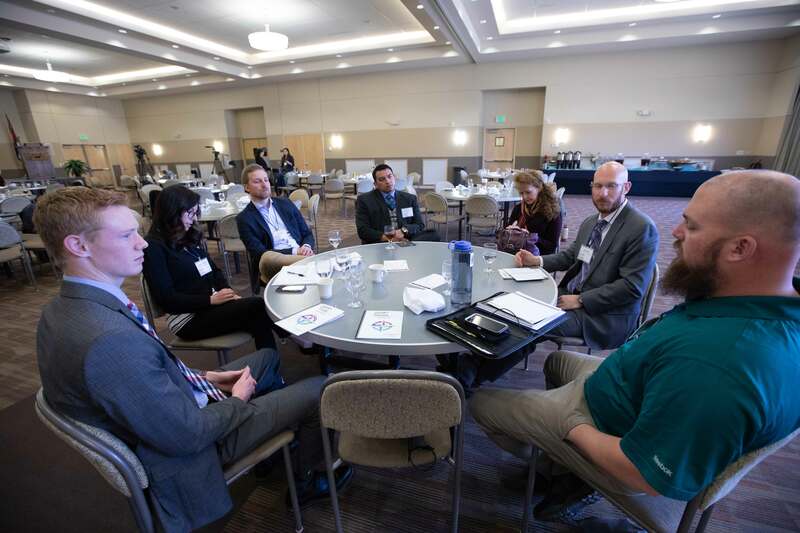 The Southern Colorado Higher Education Consortium Summit is made up of 10 institutions in southern Colorado: Adams State University, Colorado State University-Pueblo. Fort Lewis College, Lamar Community College, Otero Junior College, Pikes Peak Community College, Pueblo Community College, Trinidad State Junior College, UCCS and Western Colorado University. I was so fortunate to have attended the UCCS Daniels Fund Ethics Summit as part of the contingent from Trinidad State Junior College. Interesting speakers and interesting conversations. I really enjoyed the small group discussions mixing students, faculty, and business leaders. Thank you Daniels Fund for sponsoring this event exploring ethics in the Outdoor Recreation industry.